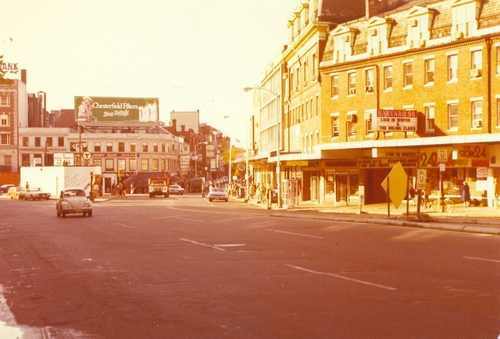 Harvard Square in the early 1980s. Brigham’s would have been on the right. 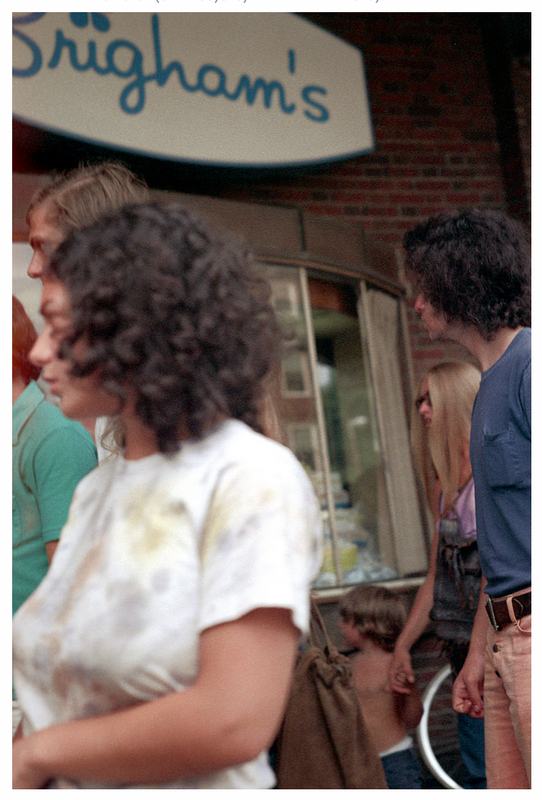 This was a little over thirty years ago, in my second year at Harvard. I was nineteen, and I was depressed. My great aunt, a woman I’d loved more than any other living person, had died. For a long time after I moved about in a grey cottony heaviness like the tumory numbness of Novocaine after some terrible extraction: an attempt to drug myself against a pain which was both personal and an abstract realization that life meant you kept losing things. It seemed a reasonable counterpart to the Boston winter, which was rat-colored and not very clean and erased the outlines and integrity of objects. November, December, January in Massachusetts meant a sense that the world was comatose and irrecoverable. Spring would probably come, but it would be painted on an underlying reality, the way nurses apply lipstick to patients in the terminal ward. 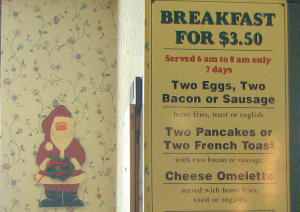 One afternoon I went into the Brigham’s diner in Harvard Square. The Square back then would be unrecognizable to anybody who knows it now. We were just on the cusp of the Reagan boom, a surfeit of flushness when the money rolled and, among other things, American teenagers were for the first time expected to spend like adults. In those pre-prosperity days even Harvard students, rich as their parents were, lived on minimal allowances: not so much to train them in Puritan austerity, though that was probably part of it, as because they were young and not supposed to need so much. Kids did not generally have credit cards then, a fact that today seems like saying they lacked legs or arms at an early stage of evolution. Moreover, Cambridge and Boston had rent control, which meant they weren’t teeming with young Tech execs. Working-class Irish or Portuguese families lived a few streets from Harvard, an uneasy cultural proximity mitigated by the fact that their disposable income was sometimes more than the undergrads’. They intermingled. As a result Harvard Square, a place presently packed with designer clothing souks and shi-shi restaurants meant to cream off the overflow of an immense largesse and maximize Mastercard profits, was full of used bookstores and record stores and cheap places to grab an undistinguished bite. There was the Bow and Arrow down by Adams House — now a pricey, brunchy pseudo-“ale house” — an Irish bar of sinisterly masculine rep right next to the gayest part of Harvard. Students would slum there with the half-expectation of getting beaten up. There was the Mug and Muffin right on the Square — now a bank — where you could have a muffin for a dollar or so in a vaguely New England atmosphere. Near it was the Tasty — also now a bank — a burger joint dating from 1916 where I gorged on grease many a drunken morning at 2 AM. There was Brigham’s too, an ice-cream chain that stretched across the state, with an outlet right there catty-corner to the Yard. It was there I learned that milk shakes were called “frappes” in Boston, and that when you asked for a milk shake you got a glass of milk and sugar instead. These places seem matters less of memory than of archaeology, part of a past now buried under mudflows of injustice and loss and easy credit. One thing about them, in addition to their cheapness, was that you could sit there alone. Expensive restaurants enforce sociability. If you’re going to pay that much you might as well kill two birds and combine it with conversation or collegial obligations. Anyway, what’s the point of spending money except to let your friends watch you? Money links us to things and people we don’t necessarily want to be linked to. It erodes the self by forcing it to be public, clapping it down amid corrosive, insistent connections. It’s the cheap little sandwich joints that let you sit there for hours unnoticed, nursing a coffee and a quiet sorrow. Harvard Square then was a refuge for loneliness, a good place to be alone. I won’t go on with quoting, because it’s a fiction; I don’t remember exactly what her, or my, words were. The fact is, I don’t exactly remember her face; like everything else it’s been worn down in memory, a stone in the stream of time. I wish I did. I do remember that it was radiant with inner happiness which almost make her cold, wrinkled skin seem warm. She had thought she was going to die, and she wasn’t. She had stopped into Brigham’s because she didn’t have anyone immediately around to talk to, anbody with whom to share this overwhelming news from the borders of all things. We talked for maybe half an hour before I left. I tried to be attentive and kind, which perhaps I wasn’t very good at. I remember all this thirty years later, and I’m not sure why. In part it’s because she was so happy, and because I felt so sad. I suppose you could say it should have put my sorrows into some perspective, but my sorrows also involved a death, so that doesn’t quite sound right. Probably at some underlying level I had always imagined, back then, that sadness and loneliness could be indulged for a while, but they were something you would leave behind. You settled into an adulthood where you were slated to be happy, and certainly not slated to be alone. In the order of things I would outgrow myself. The glimpse of a world where loneliness stretched before you like a long plain you couldn’t cross, where you would be alone in the confrontation with first and last things, jarred me as if a storm blew a window off at a celebration. Her happiness was quiet, innocent, and simple, and yet frightening because it was so hard to share. I remember that I wished I could say more than I could in half an hour. In fact there was nothing to do or say. Of course I never saw her again. Now I am fifty. If I’ve learned anything in the years it’s that you do not outgrow yourself, though this is more like ash than knowledge. That encounter has lingered behind the arras of my consciousness for a long while. I was jolted to remember it by reading yesterday that the last Brigham’s ice cream parlors in Massachusetts are closing. The franchise, a year short of a hundred years old, is defunct. The Brigham’s in Harvard Square shut down twenty years or more ago, of course. I can’t even find a proper picture of it on the Internet, which in modern terms is the equivalent of being utterly annihilated, forgotten like the Etruscan language or the moundbuilders. Forgotten like that old woman has been — I never asked her name, or if I did I forgot it. The old Brigham’s space is now a designer clothing store or a bank. I’m not sure which. I am no one for nostalgia. I don’t miss youth, with all its mistakes and misunderstandings, its belief that you can become something other than yourself with luck enough and world and time, or that your decisions do something other than define you in an invisible, encompassing cage. If I tasted a Brigham’s frappe today, here where I sit in Cairo, I don’t know what it would bring back, but it wouldn’t be a Proustian recovery: more a chalky, infinite taste of loss lingering on the tongue. To miss that would mean simply that I miss the feeling of missing things. That makes some sense, perhaps, in that you get hardened against missing things with age, and need to be prodded back to the sharp apprehension of life’s absences. But it’s nostalgia as sheer self-indulgence, an infinite regress. What I remember is the moment I realized we are alone. That stayed with me, under the surface, over the years. Alone not by choice, and not as a temporary affliction, but as a condition, the ground of who we are. My only nostalgia is that it was easier to realize this back then, somehow. It’s hard to say what I mean, but it has to do not just with places but with money. Money not only connects us, it distracts us, and it does both falsely. Those little spaces where your wallet didn’t matter much were portals, in a way, to something now easily buried under the constant titillating flows of debit and credit, deduction and gain. You could connect there to your own isolation, acknowledge it as fact. Of course, you could reach out to someone in a mawkish, temporary way because of your anonymity, or you could find somebody reaching out to you. But that only meant admitting your aloneness, your dependence on the kindness of strangers. It took a lot of courage to do that — I have mentioned the old woman’s happiness, but not that she seemed to me very brave, and that too struck me when I was nineteen. Not deep enough, though. You need to be fifty to start realizing what that courage meant. But nobody wants to think about these things for very long. It’s understandable. All that money we make and the world we build with it are meant to waylay our attention with bright, colored beguilements: to decorate the stuff of life with sprinkles. The more money there is, the better we are at it. Every place we learn something is quickly buried, because what can you with sacred dread but shovel sand over it? It becomes a designer clothing store, or a bank. I’m fifty now, and a long way from Harvard Square, and old enough to know that that forgetting is, like loneliness, what we live by. 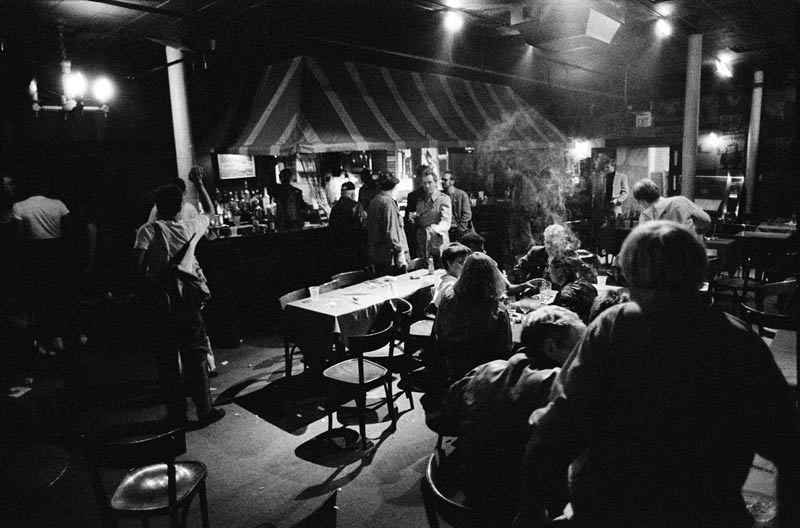 Casablanca bar in Harvard Square in the 1980s: my favorite bar, now stuffed and mummified as a posh-nosh restaurant. I am fairly sure that is me, head slightly down, turned ghostlike by a plume of smoke at the center table. Photo by Eric Antoniou, http://bit.ly/151D3P2 . This entry was posted in Politics, Uncategorized and tagged Boston, Brigham's, Cambridge, Harvard Square, Scott Long by scottlong1980. Bookmark the permalink. 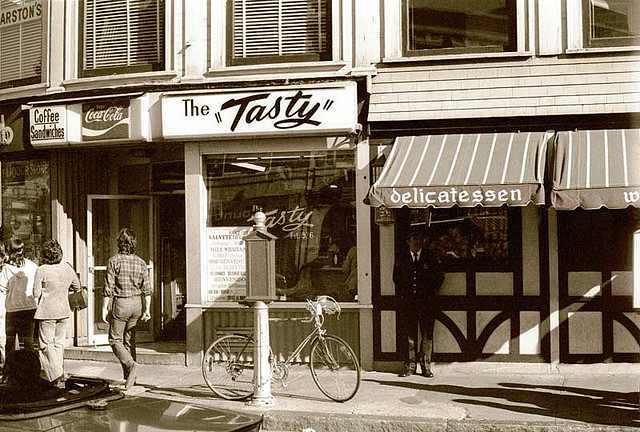 Also, The Tasty closed? Major bummer. Last few times I went to Boston, I didn’t even venture into Harvard Sq. Central Sq was a shock. Figured if that was Central, Harvard Sq would be too alienating.